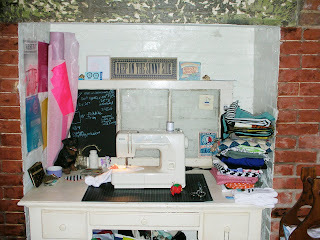 This is my sewing nook in my house. its my tiny kitchen office. its in a fireplace. how fun right?! i paintied a pane of a window with chalkboard paint so i can jot down measurements and ideas. There are bags of fabric everywhere. my wine rack has become an extension of my desk as well. The "keep on the sunny side" print is from Yee Haw Industries, my favorite letter press company. There is a mini cross stitch that Dan's mom did a long time ago and other pretty little things that make me happy to look at. Awwww... I love it. You were right about that desk, I can't believe how perfect it fits.